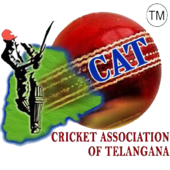 Cricket Association Of Telangana (CAT), is formed to bring out talented cricketers in the Rural areas... The present cricket Associations which are working for over 6 decades are confined only to cities, There is lot of talent in the rural areas,Mahendar Singh Dhoni is the live example,as he was spottted from Jharkand,one of the India's most backward areas and under Dhoni's Capataincy India has won two world cups-one day and T20 cup. CAT Believes there are many Dhonis waiting to be spotted in the rural Districts.CAT is striving to provide level playing field for the rural cricketers.We are proud to announce CAT is the first Cricketing body in INDIA specially focusing on Rural cricket talent. In the last Five years Cat was able to develop infra structure and organise cricket tournments in various disciplanes also conducting free summer coaching camps every years and also providing free cricket kits for the rural cricketers Cat is happy to announce to S.Ankur and K.Sravan who are selected from the telangana state for India under 16 cricket camp held at Dehradun at 2016 cat is also an applicant with the board of control for cricket in India (BCCI).